The gifts of donation given by just one person can impact so many. One organ donor can save the lives of up to eight people. 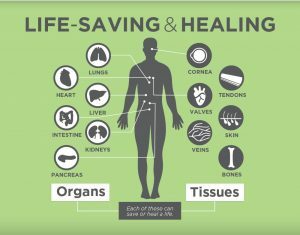 One organ, eye, and tissue donor can save and heal the lives of more than 50 men, women, and children. Donated tissues are used by doctors every day to save and enhance the quality of peoples’ lives. Donated skin saves the lives of burn victims, corneas restore sight to the blind, bones save limbs from amputation and other tissues repair damaged tendons and cartilage.